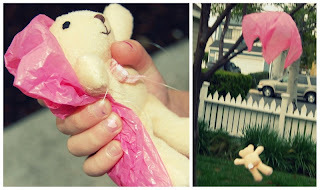 In a recent post Flipflops and Applesauce tells about their adventures with making parachutes for their teddy bear. It's cute! Go take a look! 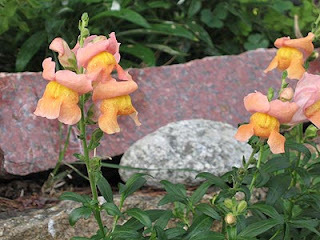 As I was growing up, my parents often took the time to point out interesting plants to me as we were taking walks or even when we were just going from the car to a storefront. It made me feel like there were "little treasures" all around just waiting to be found. 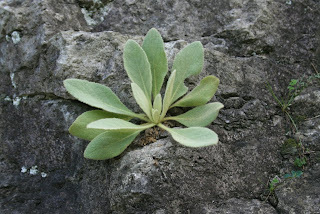 Lamb's Ear- wonderfully soft leaves that really do feel like lamb's ears! When I was growing up I remember my parents making a few Easter egg hunts for us when we were very small. Once we were a little older, however, it turned into an annual Easter egg throw! 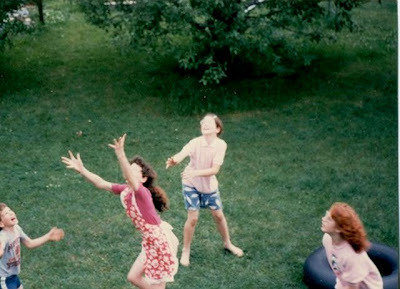 We kids would assemble on the yard down below the back deck, and my aunt and uncle would throw the plastic eggs filled with candy high into the air, at which point we would all scramble madly to position ourselves for the catch. We did a little bumping and pushing, but all in good fun, and every year we looked forward to the tradition. One year, my uncle sneakily replaced one of the candy-filled eggs with a REAL egg. I was the one who ended up with a face- full of egg. And of course, we laughed about it for years! Sometimes the best places to visit aren't the ones most widely advertised or the most expensive. I happened to run across an allusion to The Cathedral of Junk on the internet and thought it might be an interesting place to visit. We took some visiting family to go see it this past weekend, not knowing what to expect, and it turned out to become one of my favorite places to explore of all time! (It's hard to capture the scope of it here in the pictures) The Cathedral of Junk is not an established museum or tourist attraction- just a man here in Austin who has built an exquisite, quirky masterpiece out of several tons of junk in his backyard. The admission is free (but accepts donations); and it doesn't have set hours (just whenever the man happens to be around and available (so it's good to call ahead of time). I was thrilled to find such an unusual, fun place to take people for free right here in our hometown. Have any of you had similar experiences, discovering inexpensive off-the-beaten path, fun things to do with your family? I'd love to hear about them- especially so I can file them away for times when we might happen to be traveling through your part of the country! We are working our way toward M's being able to recognize and name all of the letters- not so much because I think it's "time," but more because she enjoys it. She gets a kick out of going different places and being able to point out letters that she knows on signs, keyboards, etc. Today we tried a new activity to help her learn the alphabet. I filled a big bowl full of rice and gathered up some small foam letters I had bought at Walmart. One at a time, I placed a letter in the bowl on top of the rice and asked her to name it. Some of them she knew, and others, not. Then I buried the letter in the rice and said "The "m" (or whatever) is hiding. Can you find the "m?" She would then dig away until she caught sight of it, picked it up and we cheered. Once she had the hang of that, she was ready to search for a few letters at a time. I buried three and asked her to find them one at a time. Very fun! I might also try it with colors, shapes, and plastic animals. The rules are simple and easy to learn but every round is different. You can play for a long time and not tire of it. It is flexible as to number of players. Two people can play but so can a group of up to eight! Bocce Ball is a great game for a group of mixed ages. Children can play on teams with older, more athletic adults, and it's still fun for everyone! The basic idea of the game is that a first neutral ball is thrown into an open area. Each team tries to land their balls closer to the neutral ball than the other team. Sometimes you can bump balls or move the neutral ball with your throw; so it's kind of like a combination of croquet and horseshoes. 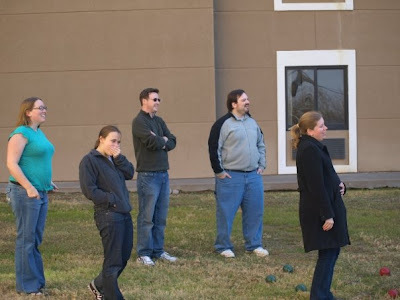 Some bocce ball sets can be quite expensive, but we bought ours for $15 at Target and think it does the job just fine. I'd say we've already gotten more than $15 worth of fun out of it! Monica, at The Homespun Heart often has good ideas for family traditions. You can read about what she is going to do to celebrate Easter this year here. In order to really concentrate on the true meaning of Easter her family has decided to move the more "fluffy" rituals like treat baskets, egg decorating, egg hunts, and bunnies to a party to celebrate the first day of spring. You can see pictures of last year's spring celebration here. I really like this idea and think that I may try it for our family in years to come. 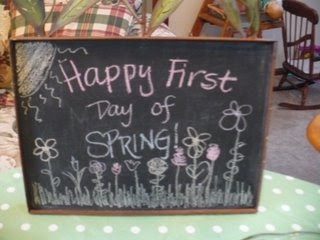 (The first day of spring is this Friday; so I think it's too late for me this year!) I like the fact that it means that one can still do the fun things, but they don't have to distract from what is more important. A friend of mine from school has what I think is a really great idea for a baby shower gift. She gives a "Book of the Month Club" subscription- but it is not through an outside organization. She does it herself! Every month for a year she sends a different children's book that she picks out to send to the new baby. I think that it would be so much fun to be on the receiving end of such a gift! The anticipation would make it so much better than receiving 12 books all at once. I think it would also make a fantastic birthday or Christmas gift for an older child. On top of being lots of fun, the gift could be done quite frugally. 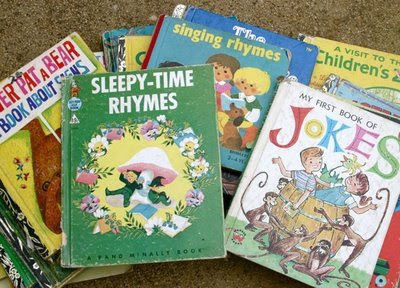 Some of us who already frequent garage sales and book sales regularly find children's books for around a quarter. If you live far away you would have to pay for shipping, but even that could be done media rate, making it relatively inexpensive. Have any of you done something like this for a present or been on the receiving end of it? I'd love to hear how it turned out! While my mother was here visiting this week she and M did this sweet lamb's head craft together. M helped mom color the ears pink. Then came the fun part- tearing apart cotton balls and gluing them to the mask (already cut out). Mom poked a hole on each side of the lamb's face and tied a string of elastic to both holes to make it ready to wear. 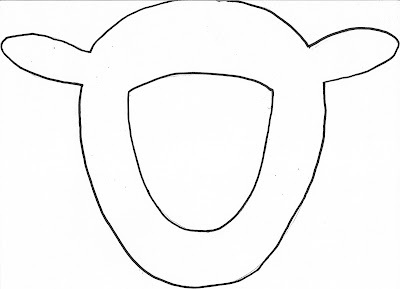 The lamb mask template is one that my mother made herself. If you click on the image below, you will have the mask full-sized and ready to print for your own use(use heavy cardstock). Congratulations Stephenie! This is actually the second giveaway she has won from this blog. Good for her! Take a look at this cute educational game that my mother made for M! Using the thin magnetic printing paper that you can buy at Office Depot she wrote out simple words and drew pictures. Then, she made individual squares for each of the letters. M's job was to take the letters and place them in the correct places on the words. It's a neat way to help introduce her to the idea that letters can function not just individually but "in teams." :-) It took M a little bit to catch on to what she was supposed to do, but once she did it was fun. Here she is giving herself a little applause for a job well done! I've been absent from my blog for a few days now because things have been a little busy around here. My parents are in town, and we have been having a really nice time together. See some pictures of our fun day today at Sand Creek Farm, a family farm north of Austin that sells raw milk and other natural products north of Austin. We got to shake cream to make butter, gather eggs, take a wagon ride, and learn all about farming the old fashioned way. Do you know a child who is going to be traveling on a long car trip soon? Here is an idea for a gift you can surprise him with to help pass the time. Find a clear plastic container with a lid, and fill it with rice, pebbles, split peas, or whatever else you happen to have on hand. 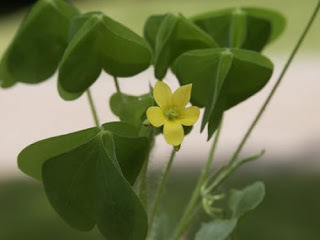 Post a list of the things to be found on the outside of the container. Include one item that is not listed, and make it some kind of a treat (maybe a note that says "Ask mom for a candy", etc). For more family and household ideas visit We are THAT Family. It's been a while since we've had a giveaway on Having Fun at Home, but this week, I'm giving away something really nice! It's a book of beautifully illustrated classic nursery rhymes, originally published in 1911. You can see that the pictures are really sweet; they have a bit of a Kate Greenaway feel to them, I think. (The actual illustrator is Henriette Willebeek le Mair). To be entered in this giveaway just leave a comment below and include your email so I can contact you if you win. I will randomly choose a winner one week from today. If you would like a second entry, feel free to write about this giveaway on your blog and then leave a second comment with a link to the post. I don't recommend too many movies or television shows, but I think that the Horatio Hornblower mini series produced by ITV and A&E is really worthwhile and especially great for older boys and teenagers. The series is based on a number of maritime novels written by C.S. Forester and taking place in the late 18th century. There are eight episodes, and each is about 90 minutes long. 2. The character development is really good. 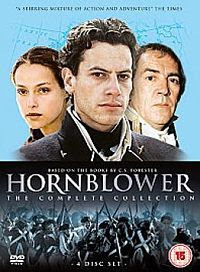 The main character, Horatio Hornblower, is not only possessed of a number of admirable character traits like perseverance, careful decision-making, and compassion, but he matures throughout the series. He's not a perfect character either, and he is often filled with self doubt because of his flaws. There is a lot for young men to emulate in the presentation. 3. Artistically, the films are well-done. It was a very high budget production for television, and that shows in the screen play, costumes, and acting. The stories are varied and exciting. You probably wouldn't be able to find this series at your local blockbuster, but if you have a subscription to Netflix you are in luck. Also, you might check your local public library. That is where I first stumbled on them!